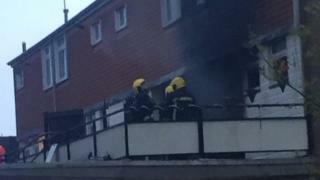 An eight-year-old boy was rescued after a blaze broke out in a two-storey maisonette in Basingstoke. The boy had shut himself in a first floor bathroom to escape the fire in Winklebury that was first reported at 19:54 BST on Wednesday. He was rescued by ladder and taken to hospital after being treated for smoke inhalation at the scene, Hampshire Fire and Rescue said. Hampshire Constabulary said it was investigating the cause of the fire. Police said the boy was kept in Basingstoke hospital overnight for observation. A five-year-old boy was also taken to the hospital "as a precaution" and a 26-year-old woman managed to escape the building, police said. The blaze damaged the ground floor, kitchen, hall and storage area of the property in Watson Way. Four crews from Basingstoke and Odiham attended the fire, which was put out at 21:40 BST.